Starting a small business may involve a lot of learning on the fly, but once you start hiring staff, the process of onboarding -- getting employees up to speed on how to be successful in their jobs -- becomes critically important. Just ask LevelJump. Based in Toronto, LevelJump hones in specifically on helping companies train and develop their sales teams, and with good reason. Generating revenue is a top priority for every organization, but the exact process of finding prospects, making a pitch and closing deals can look very different from one firm to another. LevelJump’s product allows businesses to create programs that are standardized and consistent, making it easier to get sales reps ready for action in the shortest time possible. LevelJump is also built on Sales Cloud, which may not be surprising given that customer relationship management (CRM) represents the most common tool that reps are likely to use on a day-to-day basis. 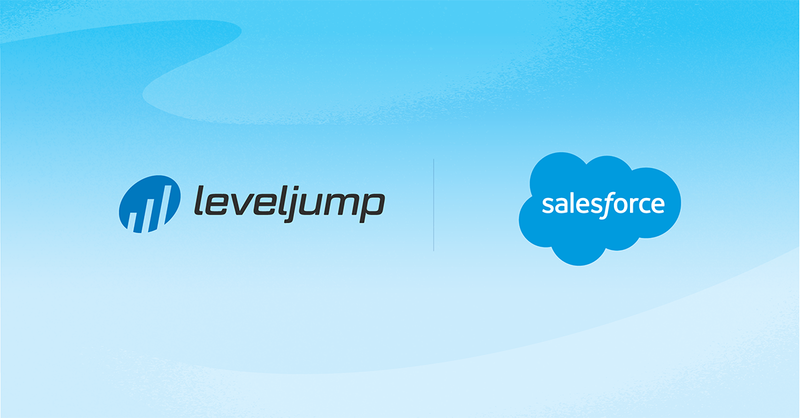 Integrating with Sales Cloud also means LevelJump can ensure the training and onboarding experiences its customers use are directly correlated to business outcomes, like revenue targets. Perhaps most impressive, LevelJump can get its technology deployed and running with customers in as little as half an hour. In this latest post in our series celebrating Small Business Month across Canada, we spoke with LevelJump Founder and CEO David Bloom to learn more about the company’s growth, and his lessons learned. 1. How Do You Define Your Company’s Purpose or Mission? We are on a mission to make every sales professional more productive and doing so faster and in a more modern way. Imagine a small company with about 150 employees. They could have a sales team in the range of 20 to 60 people. Depending on the market and the competition they face from larger companies with more sales people and resources, what’s important for them is to get the most out of their reps. What we do differently than anyone today is to tie the entire sales productivity piece to actual metrics in Salesforce. It offers our customers the ability to give reps a prescribed sequencing of activities that leads to a metric in Salesforce. Some examples of the activities include watching videos, reading case studies, or uploading your pitch within LevelJump for manager feedback to ensure you’re delivering a consistent message. Closing a first deal or building pipeline would be metrics or milestones. It’s about ensuring everyone is speaking the same language and going to market without any confusion and striving to achieve the right goals and outcomes. All in a modern way for the evolving millennial workforce. 2. What’s Your Top Priority or Goal Right Now? Driving customer success -- in other words, helping customers experience the benefits from our technology -- continues to be a top priority for us. We’re also in growth mode, and our goal is to continue to grow, to get awareness of our solution, and build pipeline, just like any other organization. Our customers, for example, often come to us when they’re about to go into a hyper-growth scaling mode; they’ve gone public or they’ve raised some venture capital/private equity funding. If you’re a team of 30 to 40 reps and you want to grow to 80 reps in 12 months, you want to be able to do that in a predictable fashion. Predictable onboarding is a massively compelling event. It means you’ll make more money faster and you’ll keep your reps longer. 3. What are Some of the Biggest Challenges You’ve had to Overcome? Being a small technology company, what’s most important is that every person has bought into the mission and vision of the company. It’s important that they understand where we’re going and why our customers love what we’re doing. If any member of the team does not fundamentally believe in our mission or vision, it will lead to voluntary -- and sometimes involuntary -- turnover. In any company, you want everyone performing at high levels. Even if you have 100 employees or only 10 employees, there’s no room to just be there with a job. 4. How has Technology Contributed to Your Firm’s Success? We invest heavily in technology. We know that leveraging tech can be a massive amplifier. Without the right tools, it’s almost impossible to get above the noise, or to have the right conversations with the right prospects at the right time. The tools we use include marketing automation, sales automation and many more. It means we can scale and be more productive because our team can focus on the non-tech types of projects. What’s amazing is that the purchase of any type of sales, marketing, or other technology has been democratized. By that I mean you don’t have to have a massive IT team and a whole room full of servers. You can be up and running, leveraging any type of cloud-based technology, quickly. You also don’t have to commit to millions of dollars. Instead, you can leverage the same service and security model as the big brands. 5. What Kind of Advice Would You Offer to Other Growing Small Businesses? Broadly speaking, I think as a small business, you have to be learning all the time. You need to stay agile, and you want to fail fast. You need to be in a great market, with a great team and be solving a problem that you and your team can obsessively search for a solution to. Always be learning from your customer. People often say you need product market fit, but I don’t completely agree with that. Instead, you always have to be surveying your customers to test the fit. At the pace of change, especially for technology, what may seem like early product market fit, could be false signals. Ultimately complacency will hinder any kind of growth acceleration. You have to keep innovating and continue to experiment across everything you do.